Why the increase in air quality problems? Older homes were “naturally” ventilated through uncontrolled air leaks and building products were manufactured without flame retardants and other additives. Today’s building products have more additives and homes are built tight compared to older homes. Tight building envelopes combined with the additives in construction materials require a controlled ventilation system to maintain optimal air quality and a home’s energy efficiency. 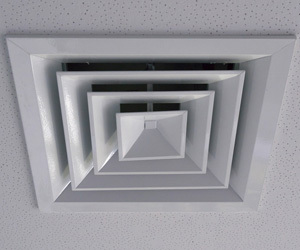 There are many factors that influence the type of ventilation system that is appropriate for a home. These can include local code requirements, building size, types of appliances, etc. Supply Only – A supply-only system includes a fan that brings fresh air into the home. The air escape happens through the natural air leaks in the home. A filter can be added to trap pollen and other outdoor air pollutants before they enter the home. A dehumidifier can be added inside the home to control indoor humidity levels. Balanced – A balanced system includes both exhaust and supply, controlling ventilation at both ends. This system includes separate fans to manage air supply and air exhaust. Overall, this is a better ventilation system than exhaust only or supply-only system.